We all have our own reasons for buying the trucks that we buy. Many are still driven by brand loyalty. Others can be easily converted if a particular model serves up the right combination of looks, features and/or performance. But when you’re researching Trucks For Sale, there’s really only one factor that should sit atop your reasoning: is it the right truck for the job? By ‘job’ I mean it in the most general sense. Sure, many trucks are built, or modified, with specific commercial use in mind. But if the last three decades have taught us anything, it’s that more and more trucks are being bought with a less specific purpose in mind. The truck marketplace can no longer claim laborers, farmers, and contractors as the ‘bread and butter’ of their demographic. Amidst the home improvement in-rush of the 1980’s, trucks proved themselves as viable household and even family vehicles. Automakers continually evolved their offerings with this in mind. As a result, today’s truck offerings range from lean and utilitarian to welcoming and luxury-inspired. And since design and performance are not mutually exclusive, truck buyers from all walks of life can rest assured that there is a truck designed for you, and for the jobs, you need to get done. You can expect to find it here at DePaula Chevy. While it may be the ‘little brother’ there’s nothing small about the midsize Chevy Colorado’s capability. In fact the 2017 Colorado is so well received that it has been named ‘Best Small Truck’ by Autobytel, ‘Most Wanted Midsize Truck’ by Edmunds, ‘Best Compact Truck for the Money’ by U.S. News & World Report, and has been recognized by Kelley Blue Book for its ‘5-Year Cost to Own’ value. 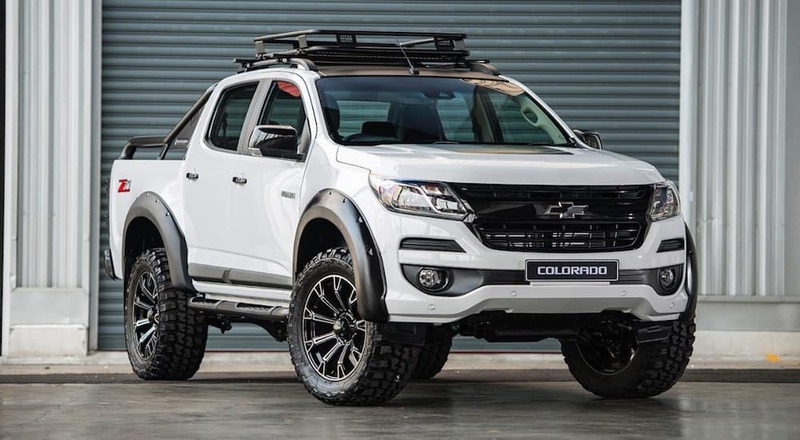 Available as either a two -or- four-seat Extended Cab, or five-seat Crew Cab, the Colorado can be configured with two different bed lengths. The Base and Work Truck tires are powered by a 2.5-liter four-cylinder paired with a six-speed manual transmission, pumping out 200 horsepower and 191 lb-ft of torque. The LT, Z71, and ZR2 trims offered tiered steps up into more luxury, passenger-friendly accommodations but also serve up more powertrain configurations. First, you can opt for the same four-cylinder (now) with a six-speed automatic transmission, or you can go bigger. A 3.6-liter V6 paired with eight-speed automatic pumps out 308 horsepower and 275 lb-ft of torque. A 2.8-liter turbocharged four-cylinder diesel paired to a six-speed automatic delivers 181 hp and 369 lb-ft. With max towing capacity at 3500 LBS (I4) 7000 LBS (v6) and 7700 LBS (diesel) there’s plenty you can get done. Ranking continually among the best-selling vehicles in America, the Chevy Silverado steps up with some accolades of its own. Named by J.D. Power as its ‘Most Dependable Large Heavy Duty Pickup (Three Years in a Row)’ it also garnered KBB love for its ‘ 5-Year Cost to Own’ value and ‘Best Resale Value’. Whether you opt for the light-duty 1500, the mid-range 2500HD or the 3500 HD you’re guaranteed countless configurations, all with satisfying powertrain options. Opt for the 1500 and you can choose between a 4.3-liter V6 (285 hp, 305 lb-ft) a 5.3-liter V8 (355hp, 383 lb-ft) or a 6.2-liter V8 (420 hp, 460 lb-ft). Properly-equipped with the Max Trailering package, the 6.2-liter V8 can tow up to 12,500 LBS. Want to jump up the 3500 HD? Take your pick between a 6.0-liter V8 (30 hp, 380 lb-ft) and a turbocharged 6.6-liter diesel V8 (445 hp, 910 lb-ft). Performance aside, Chevy stands head and shoulders above many automakers for their inclusion of available technologies. From audio system to WiFi, wireless charging stations to navigation, this isn’t your grandfather’s Chevy truck. And with spacious, comfortable cabin design there’s little that their designers haven’t thought of. Bottom-line: whatever you’re looking for in a new Chevy truck, we have you covered. If you’re considering buying a pre-owned vehicle, it’s worth mentioning that GM offers one of the best ‘Certified Pre-Owned’ programs in the industry. From Chevy’s Colorado and Silverado to GMC’s Canyon and Sierra, GM-certified vehicles come with a lot of built-in value. Consider the assurance of buying a truck with less than 5 years or 75,000 miles on the odometer. That’s the base criteria for consideration as a GM-Certified vehicle. It must then pass a rigorous 172-point inspection, to ensure that all major parts and systems meet factory standards. If they do not, they are refurbished or replaced with GM-Certified parts. Along with a guaranteed clean Vehicle History report, buyers of GM CPO vehicles receive both a 6-Year / 100,000 mile (whichever comes first) Powertrain Limited Warranty, and a 12-Month / 12,000 mile (whichever comes first) Bumper-to-Bumper Limited Warranty. Additional perks include a Scheduled Maintenance Program, a Trial of OnStar and SiriusXM satellite radio and 24/7 Roadside Assistance. That’s a lot of value! But if you’re interested in used vehicles, you’re not limited to GM CPO offerings. Sure we can offer you certified GM trucks, but we can also offer a wide inventory of used models who may be ineligible for CPO status. Whether being older than 5 years or having exceeded 75,000miles these are still dependable trucks with a lot of life left in them. And while we are unable to offer manufacturer certifications on other makes and models, we are proud to offer a wide range of them to choose from. From Ford F-Series and RAM trucks to offerings from Toyota, Nissan and Honda take a look at our inventory to see what you find. Online or in-person, we invite you to explore our extensive inventory and find the perfect truck for you, and for the jobs, you need to get done. Whether new, used or GM Certified Pre-Owned, we have a wide-range of makes, models and trim levels to choose from. Come see if we have what you’re looking for.